“Dear Monks, what is the Noble Eightfold Path? Paths help people to reach their destinations. These eight elements help a person to reach Nirvana; therefore, they are called the Eightfold Path. The person who follows this Eightfold Path eliminates all his defilements and become a noble (Arya) person. 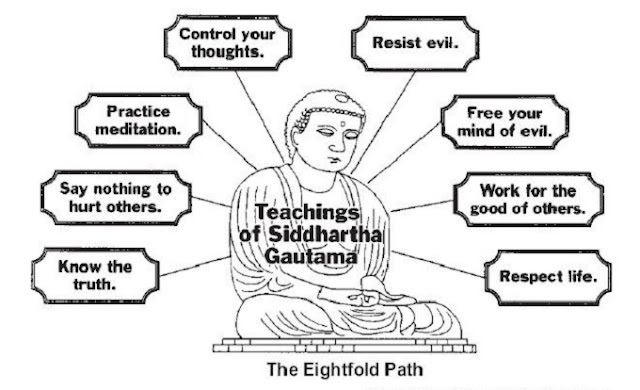 Since this Eightfold Path gives a noble end result, it is called the Noble Eightfold Path. According to the “Puggala Pannaththi Pakarana”, Nobles (Aryas) are those who have attained the four stages of Enlightenment; Sothapaththi, Sakadagami, Anagami & Arahath. The lay people become Aryas by following this path. The correct vision (Samma Ditthi) – Knowledge of the suffering, Knowledge of the reason for the suffering, Knowledge of how to eliminate the suffering (how to attain Nirvana) and ending of the suffering (by attaining Nirvana). This knowledge is called the correct vision. The Correct Thought (Samma Sankappa) – There are three types of thoughts which belong to this. Notion of wanting to get rid of greed & desire (Naishkramya Sankappa). Thoughts one has, about getting rid of wealth by giving alms, about leaving the lay life and become ordained, about a monastic life & about doing concentration (Samatha) and insight (Vipassana) meditations. Notion of loving kindness regarding the welfare of other beings (Avyapada Sankappa). Notion of compassion regarding the freeing of other beings from suffering (AvihimsaSankappa). The Correct Speech (Samma Vacha) – Refraining from lying, refraining from slandering, refraining from having an evil tongue and refraining from babbling. The Correct Behavior (Samma Kammantha) – Refraining from the three misconducts of the body belongs to this. They are, refraining from taking others’ lives (killing), refraining from taking what belong to others (stealing), refraining from sexual misconduct. The Correct Livelihood (Samma Ajiva) – For a layman, this means refraining from doing physical and oral misconduct in their occupations like cheating, lying and squandering their employers and customers….etc and earn their living honestly, legally and peacefully. Our Buddha named four types of trades one should not do since they violate the peace. They are; dealing in arms, trading humans for slavery & animals for slaughter, butchery and selling the flesh of other beings and selling intoxicants including poison, drugs and alcohol. For a priest, refraining from giving ideas of having higher qualities which he doesn’t actually possess, to receive better offerings of four essentials. The Correct Effort (Samma Vayama) – There are four types of efforts which belong to this. The effort one takes not to produce defilements which he does not have; the effort one takes to eliminate the defilements he has already amassed; the effort one puts to collect merits he never had; and the effort he takes to build up those merits. who is properly aware and conscious of the mind and thoughts, ridding himself of attachment to it; who is properly aware and conscious of the Buddhist teachings such as the five hindrances, ridding himself of attachment to it; he is with a correct consciousness. The Correct Concentration (Samma Samadhi) – If a person is rid of sensual desire and all defilements and concentrate on meritorious objectives and gain the 1st, 2nd, 3rd & 4thJhana (abiding, in which the mind becomes fully immersed & absorbed in the chosen object), he is with a correct concentration. This article was republished from www.dhammaloka.org.au. You can find the original post here.